Peter S. Marx is a partner in the firm’s Accounting and Tax Services Practice. 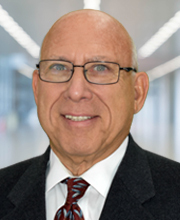 Peter brings more than 40 years of experience in accounting, financial and income tax consulting to closely held businesses and high net worth individuals in his position as partner at Gettry Marcus. In this capacity, he provides a broad range of services to a diverse client base. Peter spends most of his time working with clients to improve their financial operations and profitability. Peter offers assistance with acquisitions and due diligence matters as well as financial, tax and systems structuring. He works closely with the firm’s other tax specialists to create efficient income tax plans for both companies and individuals. He works with his client’s personnel to prepare financial projections and financing models which financial institutions utilize in their debt approval processes. Peter is a member of the American Institute of Certified Public Accountants (AICPA) and the New York State Society of Certified Public Accountants (NYSSCPA). Peter is a former member of the Domestic Relations Committee of the NYSSCPA.